A vacation home right by the sea, what else could you want? The Mediterranean beckons you for a morning swim. What makes this house special is the three 'Greek' alcoves in the basement. Your vacation home is near the village of Rayol-Canadel-sur-Mer (1 km). 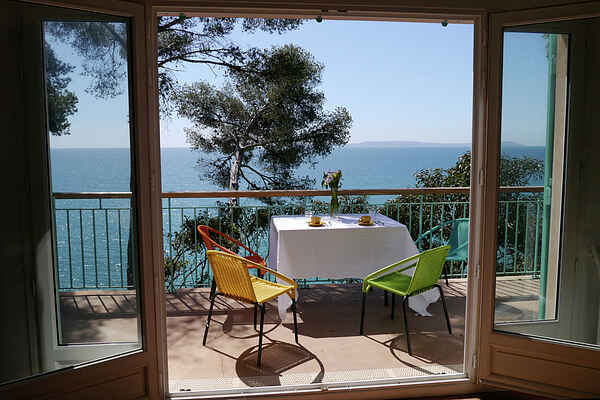 Rayol-Canadel-sur-Mer is located on the beautiful coastal road in the south of the green department of Var, where the contrast between the green of the pines and the azure of the Mediterranean is at its most stunning. There are several pretty spots in the immediate area. You can stroll through the picturesque streets of the floral village of Bormes-les-Mimosas (14 km). Or go to the harbor town of Le Lavandou (10 km), to take the ferry from there to the paradise islands of Ile de Porquerolles and Ile de Port-Cros. If you follow the coastal road to the east, you will reach the village of La Croix-Valmer (15 km) with its famous Plage de Gigaro (16 km). To finish the day perfectly, you can sit in one of the many outside cafes of famous Saint-Tropez (28 km), or have a look at the white beach of Pampelonne (30 km).